Make the best possible use of your Outdoor space for business or pleasure – sheds for storage of your Garden Tools and Garden Machinery, a Garden Workshop for all the jobs you need to do around the house and Garden, a Greenhouse for your plants and planting. You can even buy purpose built Orangeries . There is a wide range of Garden Conservatories, Garden Chalets, Garden Gazebos and Log Cabins to choose from whether you are looking for a room outside for leisure or you are lucky enough to be able to work from home. There are now a wide range of suppliers to choose from when looking for an office in the garden . We bought a fabulous 26 square meter Billy Oh Log Cabin from Garden Buildings Direct who offer a comprehensive selection of garden buildings. Simply click the Garden Buildings Direct banner below to see their full range of Garden Workshops, wooden sheds, play houses, log cabins, garden offices, workshops and Garden Summerhouses. You can search THE Gardening WEBSITE for Garden Centres by County, Garden Centres by City or Town or Garden Centres by Product and Service. We have more than 4,000 Garden Centreson THE Gardening WEBSITE. Click on the post code for your chosen Garden Centre to see a map to help you find the Garden Centre as well as the weather forecast for that Garden Centre. The UK has a mix of small businesses and national or regional chains. Garden centre chains in the UK include Dobbies Wyevales – now called The Garden Centre Group, Hillier, Notcutts and Squires. For many gardeners the only thing that really matters in a garden is the plants. If you can’t find the plant you need at you local Garden Centre then you can search Specialist Garden Nurseries by the plant type you are looking for. We have included a wide range including Specialist Nurseries from Acers, Alpines, Aquatics, Artemisia, Bamboo right through the alphabet of plant types to Tropical Conservatory and Greenhouse Plants Tulips Wildflowers. We also have a comprehensive range of the UK’s leading seed and plant suppliers to give you the widest choice of flowering plants as well as top quality seeds for fruit and vegetables so you can grow your own produce. These can usually be delivered direct to your door by Mail Order. Flowers by post – everyone loves to send flowers and receive flowers and we have flowers for all occasions – Valentines Day, Mothers Day Flowers, Weddings, or to say simply thank you ; wonderful flower arrangements and bouquets produced by talented florists. You can order flowers online and have flowers delivered the next day. Some suppliers will add chocolates or a bottle of wine to make the gift of flowers even more special. Or you can also send a tree as the perfect gardening gift for any occasion. Growing your own vegetables – what could be better. If you can possibly find any space in your garden, try to Grow your Own fruit and vegetables . You will find all you need to do this on THE Gardening WEBSITE from the all important seeds and plants through to everything you need from raised garden beds ; fruit and vegetable cages to protect your produce, garden netting, compost bins, plant protection products, plant supports and Water Butts. To keep the garden in tip top condition you will probably want to browse through our suppliers of composts , fertilisers and mulches to help your garden flourish grow, as well as the plant care products you’ll need to deal with pests and diseases and those weeds that always manage to find a space in the garden. The Internet has made the major players and specialist suppliers alike more accessible just CLICK ON THE LOGO’s below or go to Online Garden Tools and Machinery to access THOUSANDS of great deals and offers from the top suppliers and top brands for all your Gardening needs. The hard landscape is a key part of any garden. Hard Landscaping should be attractive and in keeping with the house and the rest of the garden and is usually the most expensive part of the design and build of a garden. It’s going to be there for a long time so it’s important to get the choice of materials and design right – choose the best materials you can afford. 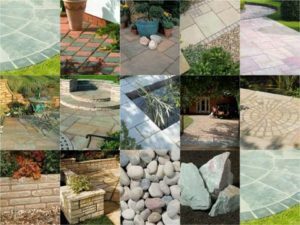 But there’s more to hard-landscaping than just Garden Paving it also includes building materials, aggregates; different types of stone such as slate or limestone and the hard features of the garden including garden lighting, garden fencing, garden walls, garden decking, railway sleepers and water features and even natural swimming ponds.